If the refugee crisis in Europe provided a unifying theme, the political and social implications of mobility raised further questions. We highlight several themes. Presenters argued that local and transnational processes of othering and difference making cannot be broken down into simple dichotomies of us/them or here/there. They are instead shifting and entangled, reflecting local and transnational political discourses. The othering of Syrian refugees in postsocialist European states contrasts with yet echoes the othering of Roms in some of the same states. Rather than a binary system of differences, it is hierarchical and relational. Zooming out to the international level, the refugee crisis has given new vitality to old stereotypes of East-West division and complicates the notion of Europeanness itself. As Dace Dzenovska (Oxford) argued, West Europeans have charged East Europeans with moral failure for their responses to the refugees, casting the postsocialist states as not quite European. Dzenovska cautioned that such emphasis on the “failure of compassion” in East Europe overlooks a Europe-wide rejection of migrants. In challenging an East-West binary and interrogating the various modalities of othering, we should think of “Europeanness” less in terms of humanitarianism and more as policing and securitization regimes threatened by (mobile) people, not states. This points to a second theme: citizenship and rights. As Nadia Kaneva (U. of Denver) argued, postsocialist European governments and publics understand both Syrian refugees and Roms as “failed citizens.” This, she asserted, contrasts with an idealized neoliberal subject. The failed citizen reveals a crisis in the nation-state’s capacity to allocate rights. This relationship is a site of constant mediation by state and private actors. Relatedly, Deborah Jones (U of Michigan) explained that people in rural Ukraine engaged in “rule of law” discourses when discussing failures of international treaties; they also invoked law to protect ownership of their small plots of decollectivized farmland. In both cases, they expect the rule of law to be respected when Ukraine “returns to Europe,” but more generally legal language is seen to have performative power. That is why these rural Ukrainians carefully guarded their tax forms, land registrations and bureaucratic certificates, trusting that these documents are “paper with potential,” vested with the hope of future value in performances of citizenship that will “tend the seeds” of democracy. Presenters also considered how local, national and EU-wide responses to the sovereign debt crisis, the conflict in Ukraine, as well as the refugees, have motivated a coalescing of diverse civil society and political actors and activists into new social movements (e.g. Indignants, Syriza and PEGIDA). These movements, while employing ideologies and rhetorics identified with opposite poles of the political spectrum, nevertheless do so in ways that complicate simple Left-Right classifications. Presenters across the two days addressed the rise of a postsocialist new Left and Right, and interrogated whether established Left-Right binaries adequately describe the politics, policies and individual actions of European parties and movements. Pamela Ballinger’s keynote address brought together many of the themes and questions raised in earlier panel discussions, adding a historical focus. Drawing on her previous work around the lives of Italian settlers following the collapse of Italy’s colonial Empire, Ballinger took up the fate of Italian civilians settled in Albania during the Italian occupation between 1939-1943. Ballinger began her talk with a photograph of thousands of Albanian migrants attempting to board a ship for Italy during an incident in 1991 when more than 15,000 Albanians arrived at Bari in a number of commandeered container ships following the collapse of Albania’s socialist regime. Although more than twenty years old, that image has attracted renewed attention from the Italian public in the shadow of the current refugee crisis and the anxieties this has provoked within Italian society at large. Ballinger used that Bari incident as a framing device to raise questions about the history of migration in Italy’s colonial Empire and the oft-neglected chapter of Italy’s imperial presence in Albania. 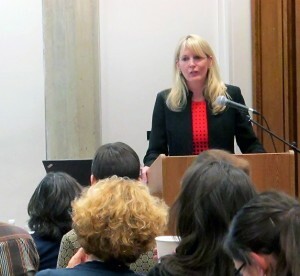 She asked the audience to consider how attending to the gaps within historical accounts of Italian colonial entanglements in Albania, North Africa and East Africa would enable us to reframe the current migrant crisis in terms of much older imperial legacies, while also complicating the dichotomy between the postsocialist and nonsocialist worlds. The first special session focused on contemporary Romani politics in the urban landscapes of Romania, Serbia, Bulgaria and Hungary. Luciana Aenasoaie (U. of Michigan) examined forced resettlement of Roms into substandard housing developments on the outskirts of Piatra Neamț, Romania. Non-Roms viewed such segregationist policies as an upholding of European values, rather than a deviation from EU norms; they failed to see relocations of Roms as fundamentally different from their own frustrations with urban transformation. Alexander Marković (UIC) considered the elision of postsocialist precarity and poverty within asylum regimes. In postsocialist Serbia, Roms are the first to lose their jobs as competition with ethnic Serbs forces them out of economic niches. Non-Roms, however, ignore local economic hardships when criticizing Roms’ attempts to obtain asylum in West Europe. In so doing, Serbs provide ethnicized explanations for Romani difference. There is a fear among ethnic Serbs that Romani asylum applications disclose the “Balkan backwardness” of Serbia. The Roms are an uncomfortable cultural intimate for majority Serb society. Elana Resnick (U of Michigan) examined the (il)logics of infrastructure in a Romani neighborhood of Sofia, Bulgaria. Wedged between legality and illegality, the residents form intimate, affective relationships with the neighborhood’s semi-functional infrastructure: the water tap is a fickle, “spitting dragon;” the leaves clogging a roadside storm drain are so much “spinach.” These relationships underpin a “politics of futility,” argued Resnick, an acceptance that waiting long enough will yield what is necessary or at least “good enough to get by.” These are not apolitical moves, but are a rejection of politics. Futility has its own political claim on the future. Politics was also in focus in Heather Tidrick’s (U of Michigan) presentation about anti-gypsy rhetoric of the extreme right in Hungary since the late 2000s, which is one clear precedent of today’s anti-migrant rhetoric. Threat and difference in both contexts are co-constructed discourses, drawing upon similar fears of Hungarian demographic decline and national disappearance. 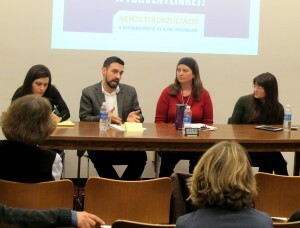 The second special session brought together three invited scholars to explore postsocialist politics in Hungary, Russia and Ukraine. Andrew Graan (Center for International Studies, U of Chicago) moderated the roundtable. He began with his observations about Macedonia and western Europe, as well as with the questions that framed the panel: What is the status of left-right in these countries, and their broader trajectory? Do people argue and act in these terms? Have the terms been rejected, taken up, or resignified? 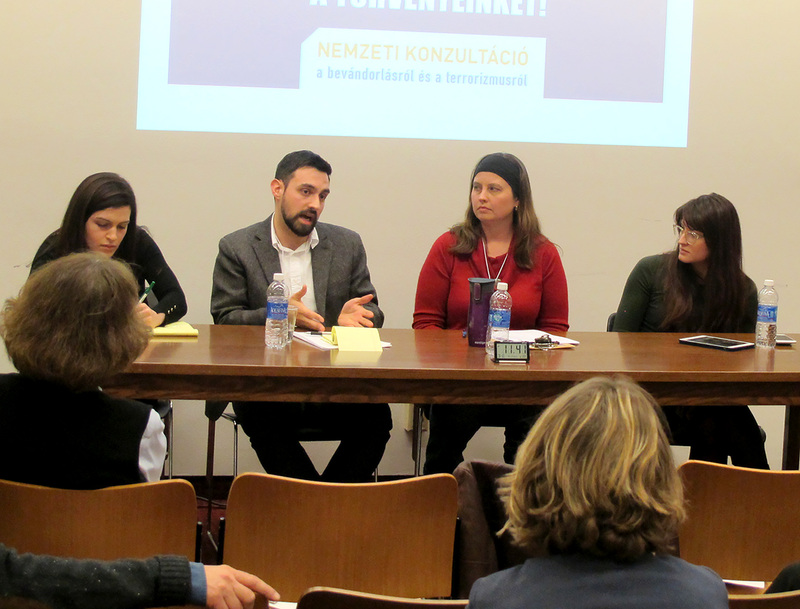 Margit Feischmidt (Center for Social Sciences at the Hungarian Academy of Sciences) discussed the rise of the far fight in Hungary and the role that the migrant crisis has played in framing contemporary Left-Right politics. She stressed the need to situate the emergence of the far right in local and regional contexts. The “relative deprivation thesis” has a role, she noted, but the emergence of a right-wing discourse attacking minority communities and migrants is more robustly explained as the product of a particular political project. It is a re-articulation of Hungarian identity as canonized by particular political actors. Feischmidt provided specific empirical examples, demonstrating how both the Right and Left employ new and old media and political messaging in order to create competing narratives around the migrant crisis. Julie Hemment (U of Massachusetts, Amherst), argued that the distinction between Left and Right no longer makes much sense in the Russian context. Rather, she contended, we are confronted with an environment of “affective populism” in which the state and other actors attempt to take advantage of popular discontent and direct it to their own ends. Focusing on the creation of the Russian state-sponsored youth movement Nashi, Hemment argued that in contrast to the common western treatment of Russian political divisions, which pits urban, liberal pro-democratic forces against a “red-brown provincial mass,” actual divisions within Russian society are more fluid. Rather than belonging to the Left or Right, members of Nashi are drawn from educated segments of provincial youth who are not in themselves “political” but see themselves in opposition to extremism in all forms, and to what they term the “Western liberal-fascist” alliance plotting against Russia. 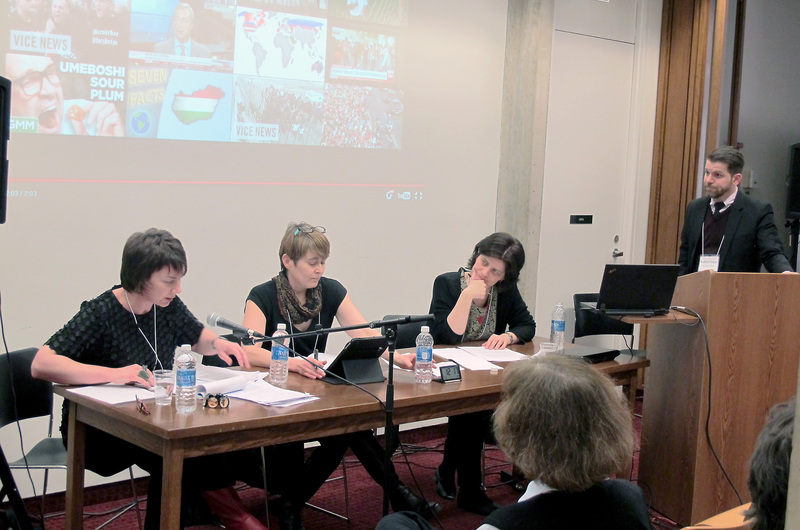 Alexandra Hrycak (Reed College) concluded the round-table with a discussion of Ukraine. She highlighted the ambiguous status of the increasingly popular far right, as seen in the support it has received among outwardly cosmopolitan and liberal urban youth who had come to view such movements as the only alternative to the Kremlin-supported Yanukovych regime. Ultimately, the rise of popular right parties in Ukraine can be understood as the result of a decline in the prestige of liberal democracy in conjunction with the widespread pillaging of the state and private sectors that had taken place under the pro-Putin Yanukovych government. The major questions that framed the roundtable were discussed throughout the symposium and addressed again in the final question-and-answer session, where a debate unfolded about the meaning and continuing relevance of postsocialism as a category and analytic, and its significance in attempts to classify contemporary political movements. Margit Feischmidt suggested that postsocialism had lost much of its analytical purchase in the Hungarian context, where popular memories of socialism compete with those of other political traditions and are informed by new developments within Europe at large. 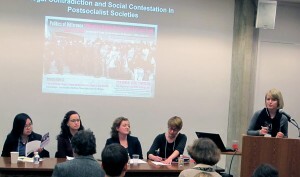 On the other hand, Larisa Kurtović (U. of Ottawa) and Nadia Kaneva argued for the continued relevance of postsocialism in the successor states of the Soviet Union. Kaneva contended that postsocialism denoted a special situation that emerged following the collapse of the Soviet political project and the resulting ideological disorientation. Likewise, Kurtović asserted postsocialism’s importance in articulating a conceptual problem space created by the Soviet experience that is analogous to the project of postcolonial studies. In either case, participants agreed that postsocialism remains a designation best understood in the context of particular scholarly traditions and their different conceptual and empirical projects. The SOYUZ symposium therefore will continue to serve as a vital forum for dialogue and exchange between different scholarly communities as they explore diverging political and social trajectories within the postsocialist world. Chicago’s SOYUZ symposium was organized by Susan Gal (Director, CEERES) and Andrew Graan (CIS), with help from the Advisory Committee (Sean Brotherton, Andreas Glaeser, Eugene Raikhel and Larisa Jasarevic) and realized with generous support from CEERES, the Center for International Studies (CIS), the Anthropology Department’s Lichtstern Fund and the Franke Institute. This entry was posted in Event Recap and tagged Albania, Bulgaria, Hungary, politics, postsocialism, postsocialist Europe, refugee crisis, Romania, Roms, Russia, Serbia, Soviet Union, SOYUZ, Ukraine. Bookmark the permalink.